A few images from my Sausalito Exhibit, “Beyond The Howl”, are on display for the next six months at the Josephine Randall Jr. Museum in San Francisco. If you are visiting the museum, stop by to see them, and reflect on how amazing it is that we have these highly social critters right here in San Francisco as neighbors! The ten images displayed depict different coyote behaviors that most people never see — seeing them will make you more aware of what being a coyote is really like. A photo is an instant slice in time of an entire sequence of events which come before and after a photo is taken. Knowing the entire sequence gives added meaning to any single slice in time, so I’ll expand on the images a little here. Coyotes display intense innate curiosity about everything and about each other: in image #4 a coyote is watching a sibling bury something which this fella then unburies and swipes for himself — so this image is also about the “trickster” for which coyotes are so famously known. Image #7 is of a distressed and angry coyote — yes, coyotes have intense feelings — jumping up on her hind legs and howling (no recording in the museum, to hear these, go to Coyote Voicings) after being chased by a dog. There’s an image of a wounded coyote after a territorial battle with another coyote (#5): he’s tattered and limping painfully — territorial battles are common and can alter a coyote’s life absolutely from stable to vulnerable if you happen to be the loser. There is an image of two youngsters hopping all over Pop (#6) revealing the affection between pups and parents in coyote families — Dad is right in there helping to raise the youngsters. Then there’s an image showing intense sibling rivalry (#1) — these previous best friends have devolved into arch enemies — which occurs in almost all coyote families as the youngsters get older. 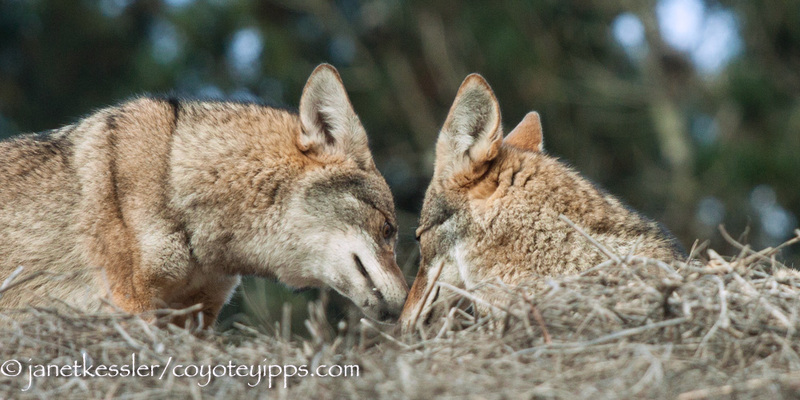 Other behaviors depicted are affection (#2) which is displayed openly and frequently in the coyote world; touching and prodding (#3 and #8) are forms of physical communication serving to emphasize something (yep! ), and close, intimate visual communication as seen in the above photo (#9) can be a heart-pounding sight when you know this one coyote is desperately soliciting acceptance from the family he’s being dispersed from by a third coyote. These ten photos include just nine different coyotes from just four of the many families I follow. Two text-panels explaining urban coyotes and dog/coyote behaviors are included. None of what I have just said in these last two paragraphs will make any sense until you see the photos, so go see them! 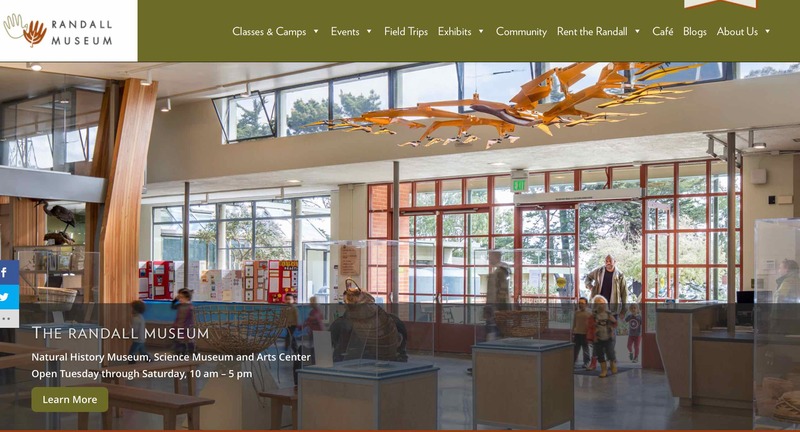 Enjoy these images while you take in a snack at the Randall’s new cafe, the Cafe Josephine, and then take a look around at the exhibits and classes offered for all ages! The museum will always be special to me because of all the many classes we took there as my kids grew up, and because my youngest kid volunteered there for many years as a pre-teen and flew the resident Harris’ Hawk, named Betty, to exercise her. My “Myca of Twin Peaks” images were on display at the Randall for over six years, until they closed the building for renovation several years ago. 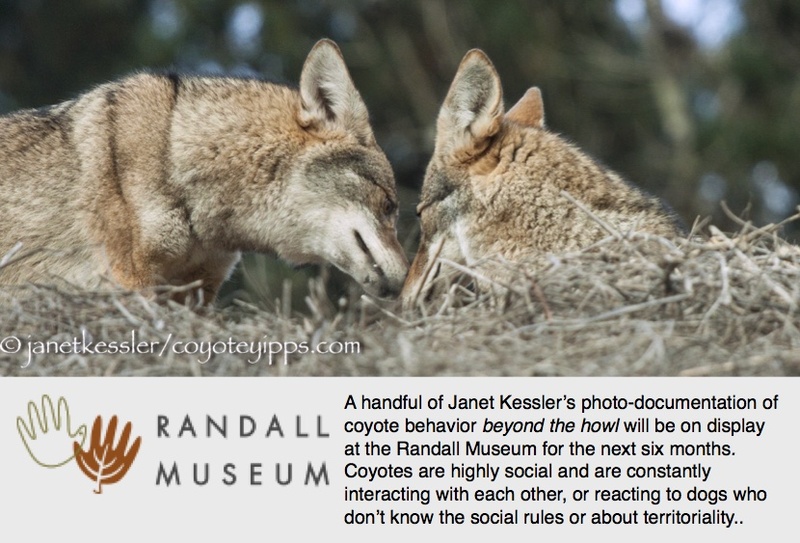 The museum reopened last year, and now they’ve again made room for some of my coyote behavior images! I have posted a new photo gallery in my Introduction Pages: UrbanCoyoteSquared GALLERY. Enjoy! !